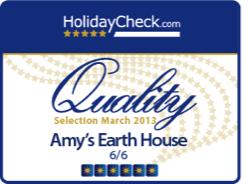 The staff at Amy's Earth House work hard to ensure that they are delivering the best service. Our team is committed to ensuring that our guests have the most enjoyable stay possible. They will try to resolve any issues immediately. Everything about this place is brilliant. The huts are cosy, clean and cool, the tree house looking over the jungle is the perfect place to spend the afternoon reading a book and Rob and Netty are some of the nicest people you'll meet. Rob was so accommodating and the food they serve is so good - Netty makes the best fried rice we've had so far in South East Asia!! The location was perfect! In August 2012, we were awarded 'Recommended by tripadvisor' status, in 2013 we won the Certificate of Excellence, awards that we are very proud to have received; they show us that you, our guests, appreciate our efforts. 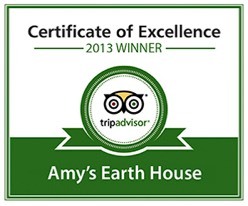 Amy’s Earth House die ideale Gelegenheit! Wir (6 junge Rucksacktouristen aus der Schweiz) reisten ins idyllische Pai und wurden herzlich und offen von Rob empfangen. Die Erdhäuser sind sauber und profitieren von natürlicher Belüftung; somit stellen sie auch tagsüber einen kühlen Rückzugsort dar. Highlight am Haus ist und bleibt das offene Bad mit der wohl heissesten Dusche im Norden Thailands! Essen kann man in Amy’s Earth House super lecker. Pai wurde durch das Engagement und die Freundlichkeit von Rob & seiner Frau zu einem unvergesslichen Erlebnis - herzlichen Dank! A un tiro de piedra del centro de Pai, merece la pena venir hasta aquí para disfrutar de una estancia maravillosa en unos bungalós cuya ubicación ofrece unas vistas maravillosas. Además, la decoración, aunque sencilla, está hecha con mucho gusto y cuidando pequeños detalles. Además, el bungaló de madera común con vistas al valle es el lugar ideal para... ser feliz. Por si fuera poco, la atención es exquisita y se presta a los viajeros un folleto con útiles consejos sobre la cultura tailandesa en general y sobre los lugares de interés en Pai en particular. Todo ello hace de Amy's Earth House el mejor alojamiento no-de-playa donde hemos estado jamás. If you have visited Amy's and enjoyed your stay, we should be pleased to receive a positive review from you too.